Blood delivers nutrients and oxygen to the body cells and transports carbon dioxide, a waste product of metabolism, from the cells. The oxygen enters the body through the lungs or gills and then this gas is released to burn energy-yielding nutrients. This gas is poorly soluble in water and blood and, therefore, needs an additional component to enhance its oxygen-carrying capacity. This component is satisfied by respiratory pigments: the metal-containing proteins hemoglobin and hemocyanin, which are red and blue, respectively. Hemoglobin (also spelled haemoglobin), found in virtually all vertebrates and most invertebrates, is the major component of erythrocytes (red blood cells). An iron-containing protein, hemoglobin was discovered by Friedrich Ludwig Hünefeld in 1840. The reversible binding of oxygen to erythrocytes, first reported in 1866 by Felix Hoppe-Seyler, a pioneer in the science of biochemistry, is dependent upon the presence of hemoglobin. Vertebrate blood is bright red when hemoglobin is saturated with oxygen. When oxygen binds to hemoglobin, oxygen’s solubility increases seventy-fold in mammals. By contrast, the copper-containing hemocyanin carries oxygen in most mollusks (such as slugs, snails) and arthropods (crustaceans, horseshoe crabs, scorpions, centipedes, but rarely in insects). Copper imparts a blue color to oxygenated hemocyanin. Hemocyanin was first discovered in snails in 1927 by the Swedish chemist Theodor Svedberg, better known for his research on analytical ultracentrifugation. Whereas hemoglobin and hemocyanin share the same respiratory function, differences are seen in how they are transported in circulatory fluids. Hemoglobin is bound to erythrocytes in a closed circulatory system of blood vessels; oxygen diffuses across the walls of the capillaries, the smallest blood vessels, and into the interstitial fluid surrounding cells. By contrast, oxygen-transported hemocyanin is not bound to blood cells but suspended in hemolymph; this fluid is contained in an open circulatory system that directly bathes the body cells. Some insects have a still-simpler open circulatory system in which their hemolymph does not contain oxygen-carrying molecules. SEE ALSO: Arthropods (c. 570 Million BCE), Pulmonary Circulation (1242), Metabolism (1614), Harvey’s De motu cordis (1628), Blood Cells (1658), Blood Types (1901), Blood Clotting (1905). A heme is a chemical compound consisting of an iron ion surrounded by a large organic ring called a porphyrin. 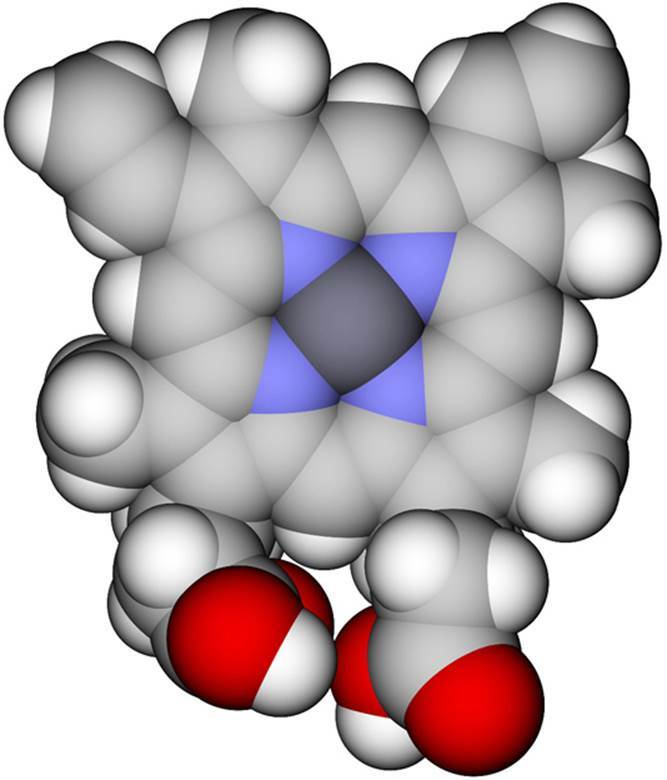 Heme B, represented here by a space-filling three-dimensional model, is an important component of hemoglobin and myoglobin.